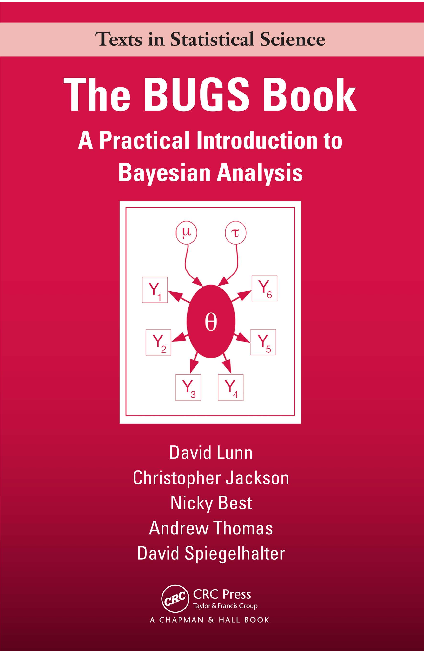 This is the supporting website for The BUGS Book – A Practical Introduction to Bayesian Analysis by David Lunn, Christopher Jackson, Nicky Best, Andrew Thomas and David Spiegelhalter, published by CRC Press / Chapman and Hall (2012). Buy: On crcpress.com (insert code 194CM in the ‘Promotion Code’ field to receive a 20% discount) | amazon.co.uk | amazon.com | compare other stores. On the examples page we provide model code, data and other material necessary to implement all of the worked examples in the book in WinBUGS 1.4.3. WinBUGS and OpenBUGS also come with a substantial set of worked examples — see the Help menu in WinBUGS or the Examples menu in OpenBUGS. A limited selection of exercises and their solutions is now available, for most chapters in the book, from the exercises page. Please email any corrections to or suggestions for the book and its supporting material, to bugsbook (at) mrc-bsu.cam.ac.uk.